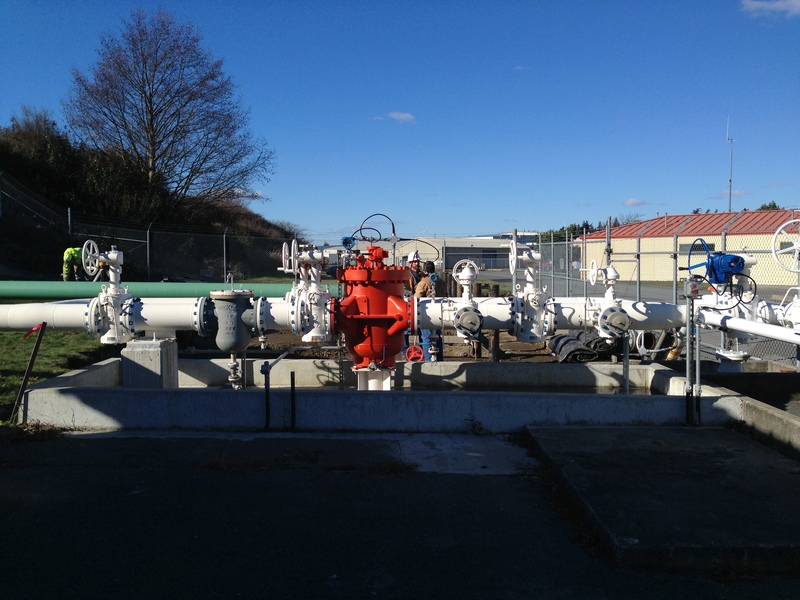 This award-winning project provided replacement of an existing 55-year-old, approximately 5 mile long cross island pipeline and pumping system that transfers fuel from the Seaplane Base to Ault Field at NAS Whidbey Island. The pipeline is integral to the fuel system at NAS Whidbey Island and previous inspections had determined that the 8-inch diameter carbon steel pipeline was at risk due to corrosion problems. To increase through-put and decrease barge demurrage costs, the new pipeline is 12-inch diameter and follows a more direct route between the two bases. As a subcontractor to the prime design professional, EEI was the designer of record for all of the fueling system components. EEI performed the hydraulics and surge analysis, designed the piping arrangement at both ends of the pipeline, selected the pumps and developed the alignment. EEI performed pipe burial calculations, selected pipe external coating systems, coordinated with the cathodic protection engineer and developed phasing requirements. EEI prepared all of the civil (5 mile plan and profile) and mechanical drawings and specifications.